PT Garuda Indonesia (Persero) Tbk - Garuda Indonesia or referred to as "Garuda Indonesia Group" is the national flag carrier of Indonesia. Garuda Indonesia is a state-owned airline company which is majority owned by the Government of Indonesia. At present, Garuda Indonesia is 60.5% owned by the Government of Indonesia, 24.6% by Credit Suisse AG Singapore TR AC CL - PT Trans Airways, and 14.9% by public. Garuda Indonesia is based in Soekarno-Hatta International Airport’s Office Area Cengkareng in Tangerang (near Jakarta) and now has 40 domestic destinations and 36 international destinations. At present, Garuda Indonesia runs its business through 197 fleets, including 108 narrow body fleets, 36 wide body fleets and 53 Citilink fleets. Garuda Indonesia also supported by 2 strategic business units (Garuda Sentra Medika Business Unit and Garuda Cargo Business Unit) and 5 subsidiaries, namely PT Aero Wisata, PT Citilink Indonesia, PT Abacus Distribution Systems Indonesia, PT GMF Aero Asia and PT Aero Systems Indonesia. 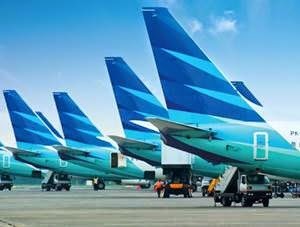 According to PT Garuda Indonesia (Persero) Tbk latest financial report (Consolidated Financial Statement as of 30 September 2016) as cited by JobsCDC.com, Garuda Indonesia booked total revenue of USD 2,865.12 million in the end of September 2016. This reflected an increase of 0.68% as compered with USD 2,845.73 million in the end of September 2015. Total assets went up by 8.05% from USD 3,310.01 million in the end of September 2015 to USD 3,576.55 billion in the end of September 2016. Male or Female with ages up to 27 years. Candidate holds at least a Bachelor Degree (S1) with GPA min. 3.00 within 4.00 scales, preferably majoring in Air Transportation Management and Aerotechnics. Willing to be placed anywhere in accordance with the needs of Garuda Indonesia. Candidate holds at least a Bachelor Degree (S1) from reputable state or overseas university with GPA min. 3.00 within 4.00 scales. The candidate with prior experience minimum of 1 year in service and/or as analyst is preferred. Fresh graduates are welcomed to apply. Computer literate (internet, Ms. Office application such as Word, Excel, Visio, etc). Able to work individually and in a team, willing to work with tight deadlines. JobsCDC.com now available on android device. Download now on Google Play here. Please be aware of recruitment fraud. The entire stage of this selection process is free of charge. PT Garuda Indonesia (Persero) Tbk - Operation Controller, Service Analyst Garuda November 2016 will never ask for fees or upfront payments for any purposes during the recruitment process such as transportation and accommodation.